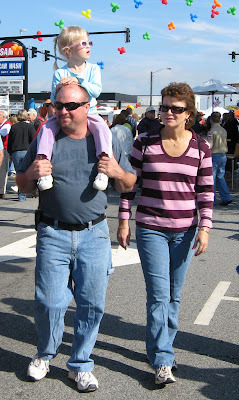 I've been waffling on the Lexington, North Carolina Barbecue Festival. It's been my birthday trip for a number of years, since my b-day is October 24th which is always close to the festival date - near the end of October. This year (2008) is the 25th anniversary of the Barbecue Festival. That makes it appealing in terms of the history, but I am not that keen on huge crowds. A big street party is one thing. When you can't hardly walk for all the people - that's another thing. We go early to the festival. I'm not talking 6 a.m. or anything like that. But, we shoot for 9 to 10 a.m. and when it first opens up. By noon, it's like a madhouse at the festival. The lines at the parking lots outside of town (where you catch the shuttle buses) are backed way up. I'm always glad we're leaving rather than coming when it gets backed up like that. I also have issues with the Port-o-Johns. They are not awful early, although last year I had to try three before I could manage it. It was hot last year though, and it's supposed to be cooler this year. Thank goodness. I'm not a total prude, but smells can do me in. Put me in a hot porta-potty with some packages, and I bust out of the door like the Incredible Hulk. Arrhhhggg. Then, I have to get in another potty line and hope for better. The other waiting people do find this amusing. I cough and gag and then my eyes water. Everyone then knows which line not to wait in. I will make a note to self not to drink much on Barbecue Festival morning and hope I can hold it. If this is not possible, then I must decide if I go before getting barbecue and maybe not having much of an appetite after or waiting and then maybe adding to the bad juju in the port-o-pots. As long as I am not jam packed in waves of humanity or fumbling for the porta-potty door handles (to get out fast), then I enjoy the heck out of the Lexington BBQ Festival. They have a lot of great music and shows. I like to meander along the main stretch and hear various types of music and see the magic shows and characters like Dora and Superman. I generally do some Christmas shopping at the Barbecue Festival. They have various booths with crafts and with barbecue sauces. I pick up some new flavors for my barbecues and to give to friends. I usually get some local honey and some dip mixes. I've also found some great crafts like a spider made out of car parts that was quite unique. We also have enjoyed the PVC pipe marshmallow shooters and get more for kids on our gift list. This is the 25th year, so it may be bigger than I enjoy. Guess I'll find out in two days. I was back and forth on whether to go, but I called around. Right now, it's a go. Will check back in later with the details. Hoping for a great birthday trip. Making sure to use the bathroom at home beforehand though.